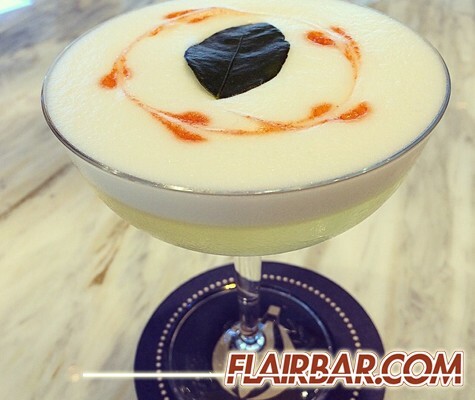 Welcome back with the latest edition of Flavors for FlairBar.com. It’s been a crazy two months in the Great North aka Toronto and the egg whites have been FLYING (sometimes, not in a good way). My fellow bar men and I have made a conscious decision to try and pull back our egg use, but before we do I had to share this cocktail with you. We’ve started using the “reverse dry shake” method when shaking egg white cocktails and we’re getting better than great results. With a hard shake over ice and then again without ice, we get beautiful foam consistently with as little as 30 seconds of shaking TOTAL. Try it out and let us know your results. Procedure: This infusion is as simple as grabbing a bottle of Tito’s Vodka and adding green tea. We used loose Chinese green tea, but store-bought green tea bags will work just as well. The only difference will be the final flavor. Infuse your vodka for approximately 3 days. Use more green tea to speed up the process. Once you strain the green tea out through a coffee strainer, you are ready to mix. Add 2 oz.’s Green tea-infused Tito’s Vodka, 1 oz. fresh lemon juice, 1oz. Finest Call Bar Syrup and 1 egg white to a shaker tin. Fill your mixing glass about 3/4 with ice and shake vigorously. Strain your mixture directly back into the tin and dump the ice. Shake again without ice and double strain into a chilled coupe glass. Garnish: Six well placed dots of angostura dragged through with a cocktail skewer. Place a raw tea leaf in the center of the glass. It’s been a short season in Toronto and we’re currently straddling the line between summer and Fall. This cocktail works in both and is actually surprisingly versatile. The Kumquat cooler is refreshing and light. Expect to make more once you make the first one. If you can’t find kumquats switch to something else colorful and visual. Pomegranate seeds are great and even brightly colored thin sliced peppers would be interesting. Get creative! Procedure: In a mixing tin mix 2 oz.’s Tanduay Silver Rum, 1 oz of fresh lemon juice and 1 oz. of rosemary simple syrup and fill your mixing glass with ice. Shake vigorously and strain over fresh ice into a tall Collins glass. Add soda water to 1/2″-1″ below the rim of the glass and gently stir to incorporate. Add sliced kumquats to the top of the glass and using your bar spoon guide them into the glass spacing them evenly between the glass and ice. Finally garnish with a tall, fresh sprig of rosemary. 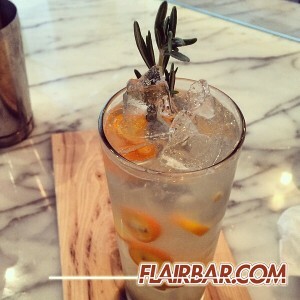 Garnish: Sliced kumquats and a tall rosemary sprig. My Beverage Director recently asked me to come up with a series of fall cocktails. I came up with several and the first one I thought of was this. 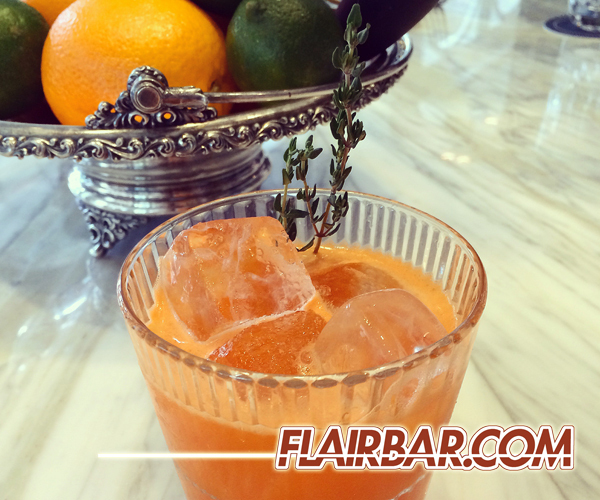 Carrots make delicious juice when blended with soft floral juices like plum or apples. Remembering a cocktail I had worked on at Cafe Boulud I knew whiskey would blend seamlessly. Add some herb syrup and citrus for balance and we’re in business. This cocktail is delicious and visually, a great color. Most larger cities have juice purveyors who can provide this blend for you every couple days. If not, make the juice yourself and strain it several times. Be sure to keep it sealed and refrigerated as fresh juice ferment quickly. Procedure: In a mixing tin add 1.5 oz of the carrot-plum blend, 1.5 oz of Bulleit Bourbon, .5 oz of Cointreau, 1 oz of fresh lemon juice and 1 oz of thyme syrup. Add ice to your tin and shake vigorously. Double strain your chilled cocktail into a rocks glass over fresh ice. Garnish: With a fresh sprig of thyme.